The lionfish is a beautiful and poisonous saltwater fish that is native to the South Pacific Ocean. Unfortunately, it has become separated from its native ecosystem and become an invasive species in the Atlantic Ocean. Introduced by saltwater fish collectors in southern Florida, the lionfish has no predators in the Atlantic and Caribbean and has spread rapidly in this region. Because it threatens the Atlantic coral reef ecosystems and its only predators are humans, the management strategy to deal with this invasive species is basically Catch and Eat. Various groups hold lionfish derbies, where cash prizes are given to scuba divers who catch the most lionfish. In May 2011, participants in a lionfish derby in the Florida Keys caught 500 lionfish and afterwards dined on fried lionfish bites and lionfish wrapped in bacon. 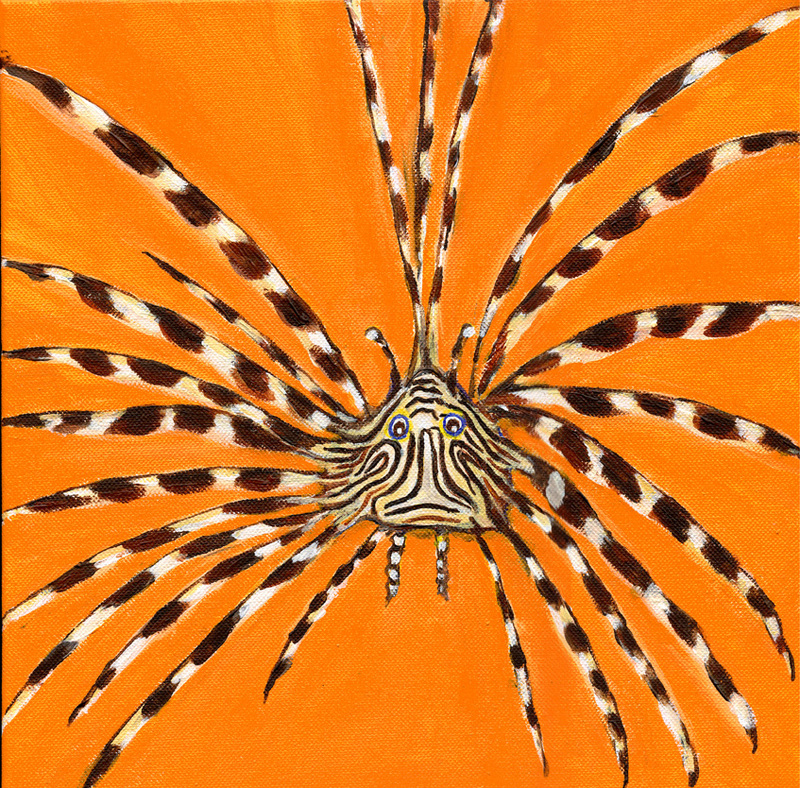 Conservation groups encourage the catching and eating of lionfish, and have provided many lionfish recipes online. The Lionfish PSA website has some fascinating facts about lionfish and makes the additional point that we should have better controls of the international marine aquarium trade that keeps bringing these beautiful but deadly fish into peoples' fish tanks. Hey! I think this website is trying to hypnotize me! 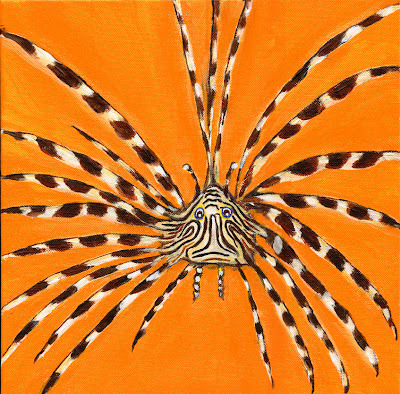 What with the little critters over there with their whirling eyes and then this strangely mesmerizing lionfish painting. I hope I'm not going to lose an hour later as I carry out some nefarious deed for you! You are getting sleepy...very, very sleepy. And thanks for the nice comment! Hey, this is super cool....it's a bit of an optical illusion, too! I love it! Thank you for your comment! I really like this colors! Love this theme, Love this colors!